The decommissioned USS Independence was among the targets in the July 25, 1946, atomic bomb test at Bikini Atoll in the South Pacific. The damaged ship was towed to San Francisco for decontamination and scuttled five years later about 30 miles offshore. 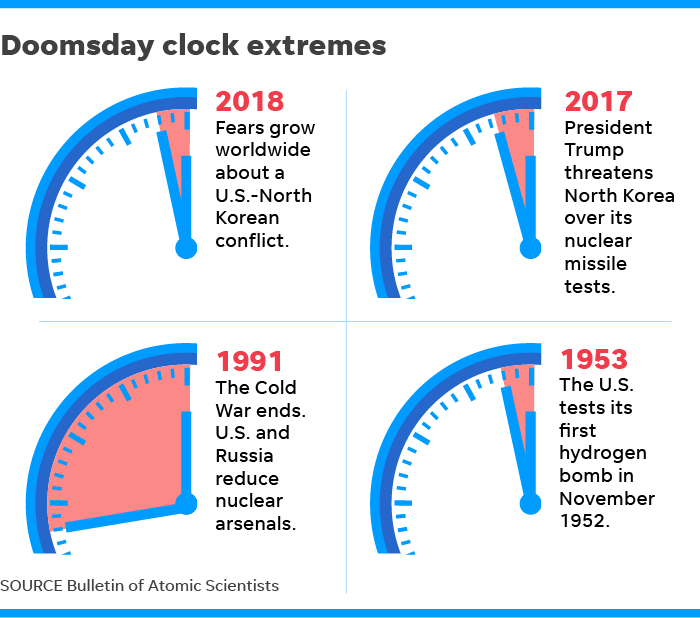 Scientists moved the hands of the symbolic "Doomsday Clock" closer to midnight on Thursday amid increasing worries over nuclear weapons and climate change. The symbolic clock is now the closest it's been to midnight since 1953. It was also two minutes to midnight in 1953 when the hydrogen bomb was first tested. "We've made the clear statement that we feel the world is getting more dangerous," said Lawrence Krauss, chair of the Bulletin's Board of Sponsors and director of Arizona State University's Origins Project. "The danger of nuclear conflagration is not the only reason the clock has been moved forward." "The greatest risks last year arose in the nuclear realm. North Korea’s nuclear weapons program appeared to make remarkable progress in 2017, increasing risks for itself, other countries in the region, and the United States," the statement continued. "Hyperbolic rhetoric and provocative actions on both sides have increased the possibility of nuclear war by accident or miscalculation." Lawrence Krauss (left), director of the Arizona State University Origins Project, and Robert Rosner (right), professor at the University of Chicago announce that they have adjusted the so-called 'Doomsday Clock' to two minutes to midnight at the National Press Club in Washington, DC, on January 25, 2018. "On the climate change front, the danger may seem less immediate, but avoiding catastrophic temperature increases in the long run require urgent attention now. The nations of the world will have to significantly decrease their greenhouse gas emissions to keep climate risks manageable, and so far, the global response has fallen far short of meeting this challenge,” the Bulletin of the Atomic Scientists said. "Today’s Doomsday Clock announcement must serve as an urgent wake-up call — and could be the last one we get," said Derek Johnson, the executive director of Global Zero, a group that wants to eliminate nuclear weapons. “Last year, the Clock ticked forward largely in response to candidate Trump’s alarming campaign rhetoric. But the reality of a nuclear-armed President Trump running loose in the world is worse than we feared, and that is clearly a central factor in this decision," Johnson said. The closer to a setting of midnight it gets, the closer it's estimated that a global disaster will occur. The farthest it's been from midnight was in 1991 as the Cold War ended when the clock was 17 minutes to midnight.